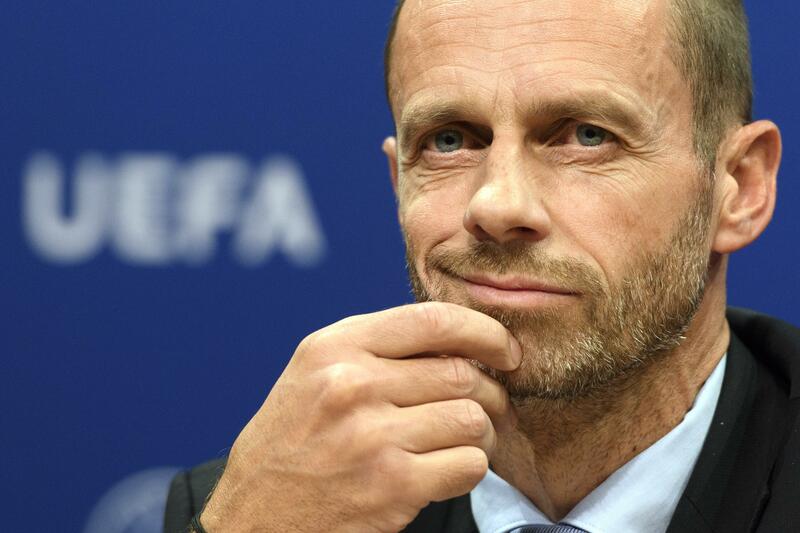 GENEVA – The easy part of UEFA President Aleksander Ceferin’s next four-year term as the leader of European soccer’s governing body is winning re-election Thursday as the only candidate. After the ballot formality in Rome, challenges stack up for the lawyer from Slovenia – elite clubs demanding more Champions League money and FIFA wanting new competitions that could threaten UEFA’s prized assets. Long-standing conflict with FIFA and its president, Gianni Infantino, will likely flare up again ahead of a mid-March meeting in Miami. Ceferin will also need to protect the Champions League – and keep a breakaway Super League at bay – through two rounds of negotiations to shape it for the next decade. He must strike a balance between a clique of top clubs against national leagues and smaller clubs who want to stop a wealth gap widening. Blocking Infantino’s expansion plans has helped define Ceferin’s leadership. Ceferin and Infantino were elected in 2016 to replace their banned predecessors, Michel Platini and Sepp Blatter, whose hostilities they have renewed. Peace should reign in Rome after Infantino’s arrival Wednesday at UEFA’s annual gathering. Hours earlier, Infantino should get confirmation he also will face no opponent for re-election on June 5 in Paris. The main issue is Infantino pushing his FIFA Council for almost a year to accept a secretive $25 billion offer from private investors. They want to jointly run an expanded Club World Cup and worldwide Nations League – originally a UEFA idea – for 12 years from 2021. A bigger Club World Cup, of perhaps 24 teams including 12 Europeans, could take attention and value from the UEFA-run Champions League. Infantino has closely allied with South American soccer president Alejandro Dominguez, who typically airs ideas that promote the FIFA leader’s agenda. FIFA will stage more rounds of consultation before the next FIFA Council in Miami. Ceferin was elected promising to support the squeezed middle ranks of European soccer, just weeks after a key Champions League deal. His soon-to-be management staff signed an agreement with European club leaders that weighted entries and cash distribution from 2018 in favor of the most storied teams in the wealthiest leagues. Defining that is hard, beyond creating a third-tier competition to kick off in 2021. Calls on lawmakers for help within European Union rules have been tough to follow through. “We would like to see that these are not just promises but for UEFA to put in place concrete proposals and implement them,” the European Leagues group said in a statement. Domestic leagues want a “fairer and more equal revenue distribution model” in the Champions League from 2021 in talks aiming to reach an agreement this season. The influential European Club Association says 2024 is the time to enact serious Champions League reform. Ceferin works closely with European Club Association leader Andrea Agnelli, the Juventus president who Infantino would like to win over and help sway the Club World Cup debate. The pre-2024 round of Champions League negotiations will be a true test of the Ceferin-Agnelli relationship. The ECA’s two seats on the UEFA executive committee was a Platini policy that delivered Agnelli to Ceferin, and also the more controversial Nasser al-Khelaifi. On Thursday, UEFA member federations should ratify the Paris Saint-Germain president joining the ruling panel. Currently, al-Khelaifi’s club is under investigation for possibly deceiving UEFA’s financial monitoring rules. Swiss prosecutors also suspect al-Khelaifi of bribing a senior FIFA official in a World Cup TV deal in his other job as head of Qatari broadcaster BeIN Sports. BeIN is also a UEFA rights holder. Europe has dominated international competitions since 2016, giving Ceferin more authority to defy FIFA. Four European teams – France, Croatia, Belgium and England – reached the 2018 World Cup semifinals, and a fifth – Germany – sent a reserve team to win the 2017 Confederations Cup. The Champions League is the gold standard for clubs, and Europe even bailed out South America’s equivalent, the Copa Libertadores, by letting Spain host the delayed second-leg of a troubled final last December. Ceferin is the only elected president from east of the old Iron Curtain in UEFA’s 65-year history. The divide has been further rebalanced. Europe’s three FIFA vice presidencies were long held by France, England and Spain until the old order was shaken up after investigations by the FIFA ethics committee and Spanish authorities. Ceferin replaced Platini, and when Angel Maria Villar of Spain had to resign, billionaire banker Sandor Csanyi of Hungary was picked to step up. Platini played politics when picking host cities without an open selection process. It helped explain why Cardiff and Kiev staged the past two Champions League finals despite a shortage of convenient flights and hotel rooms for fans. The first venue chosen on Ceferin’s watch, Atletico Madrid’s home stadium for the next final on June 1, had to bid for the honor. Germany will host the 2024 European Championship after clearly beating Turkey in the first UEFA executive committee vote to include a human rights assessment. During his next term, Ceferin wants Europe to present only one candidate for the 2030 World Cup. FIFA members pick the host in 2023. Ceferin seems to prefer a combined Britain and Ireland plan and wants soccer officials to propose bids. He has objected to governments taking the lead in Spain and across the Balkans. If UEFA hopes top clubs will accept taking a smaller share of Champions League revenue, at least its president led the way. Ceferin agreed in 2017 to donate 1 percent of his salary to the Common Goal charity project co-founded by Manchester United playmaker Juan Mata. That salary was revealed to be 1.56 million Swiss francs ($1.56 million) with no bonus, taxed both in Slovenia and Switzerland. The FIFA president’s base salary is similar, though Infantino gets other allowances and a performance bonus for the World Cup year. Published: Feb. 5, 2019, 8:01 a.m.